If you are applying for a National Quality Award, please read through the entire application before starting the process. We encourage all centers to start the application process early, and to work continually throughout the coming months to ensure accurate and complete information is given. If you have any questions, please contact the Quality Award staff at qualityaward@ahca.org. We look forward to your application! For more information on the National Quality Award Program and the Examiner process please visit our website. The NCAL Customer Relations Committee seeks to better understand how assisted living providers are staying on top of resident and family member satisfaction. Please take no more than 5 minutes to complete this online survey. Your feedback will help guide the NCAL Customer Relations Committee in developing valuable resources that can help assisted living providers enhance their customer experience. The survey will remain open until Friday, August 17. The Quality Initiative for Assisted Living includes a goal to increase customer satisfaction, so that at least 90% of residents and/or family members are satisfied with their assisted living experience. The Quality Initiative aims to meet this goal by March 2021. Find more on the customer satisfaction goal, including resources and provider stories. The American Health Care Association and National Center for Assisted Living (AHCA/NCAL) announced Linda Kluge, RD, LD, CPHQ, as the 2018 recipient of the Mary K. Ousley Champion of Quality Award. Kluge, an Executive Director at Alliant Quality, a Quality Innovation Network – Quality Improvement Organization (QIN-QIO) for Georgia and North Carolina, is recognized for her contributions to quality in long term and post-acute care. For more than 40 years, Kluge has worked to advance quality performance in the profession. As part of a national effort to encourage patient-centered care, she co-founded the Culture Change Network of Georgia, a group focused on promoting and fostering culture change to improve the quality of life for older Georgians. Under her leadership, a Georgia coalition and advisory board were formed that played a role in the safe reduction of antipsychotic usage in skilled nursing centers throughout the state. She also championed the development of an educational toolkit used by nursing centers nationwide through the initiative Interventions to Reduce Acute Care Transfers (INTERACT®) to reduce unnecessary emergency room visits and hospital readmissions. Kluge received the Distinguished Service Award from Aging Services of Georgia in 2010 and was the recipient of the President’s Mentor Award from the Florida Dietetic Association. AHCA/NCAL presents the Mary K. Ousley Champion of Quality Award to an individual that has made a significant national contribution to advancing quality performance in long term and post-acute care. Recipients display leadership in the development, promotion, and implementation of quality improvement initiatives that have resulted in measurable improvements in the quality of care and quality of life for individuals in long term care. In 2011, the Friend of Quality Award was renamed the Mary K. Ousley Champion of Quality Award to honor the ongoing legacy and commitment to quality care demonstrated by its namesake, Mary Ousley, a licensed nursing center administrator and nurse who has dedicated her life to quality improvement programs in long term care. Kluge will be presented with the award at AHCA/NCAL’s 69th Annual Convention & Expo in San Diego, California, October 7-10, 2018. Get Ready for the AL Cost Calculator – COMING NEXT WEEK! Launching August 15, the AL Cost Calculator is a new member benefit that will help you put costs behind the care you provide. Get a sneak peek of the AL Cost Calculator at our live webinar event on ahcancalED. You’ll hear from the developers of the tool and see a live demo. Register now – space is limited! The AL Cost Calculator is a web-based, enhanced resident assessment tool that assesses how costs are allocated across residents. Better understand the needs of your residents, so you can put the right staff with the right skills in the right place and at the right time. Multi-facility companies can see their company’s costs across different buildings and over time. Learn more about the features and benefits. The AL Cost Calculator will be available to NCAL member providers at no additional cost – it’s included with your membership. Already interested? NCAL members can pre-register for the tool right now. Sign up to be ready to access the AL Cost Calculator come August 15. The National Center for Assisted Living (NCAL) Yesterday announced the recipients of the 2018 NCAL Awards Program, which recognizes exemplary assisted living caregivers and programs. The four award winners represent the best of the assisted living profession, a sector of long term care that fosters choice, dignity and independence. Next week marks the beginning of the annual month-long break when Members of Congress return to their home states for a prolonged work period. This is a great time for AHCA/NCAL members to meet with their Representatives and Senators during facility tours and town halls. The August recess is typically a time where AHCA/NCAL members schedule hundreds of meetings with their Members of Congress. Lawmakers are particularly eager to meet with constituent providers and residents during an election year to hear from voters on what issues are affecting them. Both the House and Senate will be out the first week of August for state and district work periods. Senate Majority Leader Mitch McConnell announced earlier this year that the Senate recess will be abbreviated, and members will return to Washington for the remaining weeks of August. House Majority Leader Kevin McCarthy said he has no plans for representatives to shorten their August recess. AHCA/NCAL has numerous resources for members who would like to host a facility tour during the August recess. Online, members can access facility tour guides as well as the most recent issue briefs for post-acute and long term care policy. If members need further assistance, they can contact Matt Smyth or Drew Thies. Last Week for the Long Term Care Career Center’s Spectacular Summer Sale! More than 86,000 qualified health care candidates are looking for jobs on the national job board network built for health care professionals. Lead them to your job vacancy through the AHCA/NCAL Long Term Care Career Center. The LTC Career Center is designed to help members be competitive in attracting qualified candidates to fill their health care positions. The AHCA/NCAL Infection Preventionist Specialized Training (IPCO) course is getting rave reviews from those who have completed the course. "The IPCO training was fantastic, very informative, easy to use and organized. I definitely recommend this product for all IPCO, DON and ADON,” says Jesalyn Garcia with Holly Heights Nursing Center. Jesalyn isn’t the only IPCO fan. A solid 97 percent of health care professionals who have completed the AHCA/NCAL Infection Preventionist Specialized Training (IPCO) course thus far recommend that their colleagues take the course if they are interested in learning more about infection prevention and control and antibiotic stewardship. That’s because the AHCA/NCAL course delivers! The on-line course provides education for healthcare professionals who seek to serve as Infection Preventionists and prepares individuals to meet the antibiotic stewardship requirements that took effect for nursing facilities on November 28, 2017. The training is also beneficial for assisted living centers because the methods for preventing and controlling infections are universal and apply regardless of setting. The Infection Preventionist Specialized Training (IPCO) course provides education for all healthcare professionals who want to lead infection prevention efforts and prepares individuals to play an active role in the antibiotic stewardship efforts. Antibiotic stewardship is an overarching goal and priority among all health care professionals and is receiving a lot of attention from state and federal health care regulators. While CMS has announced plans to offer a free infection prevention training course some time in Spring 2019, AHCA/NCAL recommends investing in staff training now rather than waiting at least another year to train staff on the requirements that already are in effect. Despite the recent CMS training announcement, nursing facilities will continue to be surveyed on all the new infection prevention and control requirements and the antibiotic stewardship requirements – the same requirements leading to the most commonly cited F-Tag since November 2017 under Phase I and Phase II of the CMS Requirements of Participation and the implementation of the new nursing facility survey process. The 2010 health care law could take center stage in the Senate debate over the confirmation of President Trump’s nominee to the Supreme Court, Brett Kavanaugh. If the administration gets moderate Democrats to support Kavanaugh, they will likely have to convince them that the pick will not cause significant harm to the Affordable Care Act (ACA). The Democratic Senator from West Virginia, Joe Manchin, already expressed concerns about Kavanaugh’s position on the legality of certain parts of the ACA. In a speech given at the Heritage Foundation last year, Kavanaugh said he thought the Supreme Court was wrong to uphold the ACA’s mandate as constitutional. Sen. Manchin and two other Democratic Senators, Heidi Heitkamp (N.D), and Joe Donnelly (Ind. ), joined their Republican colleagues in the Senate to confirm Gorsuch, but the upcoming election and recent fight over the repeal of the Affordable Care Act could change calculations for the upcoming confirmation debate. Republicans have a slim, 51-49 majority in the Senate. While Senate rules were changed last year to allow for the confirmation of Neil Gorsuch on a simple 50-vote majority, Senator John McCain is in Arizona and not currently participating in Senate votes due to his ongoing cancer treatment. Without support from Senate Democrats, they will have to get every other Republican to support the Kavanaugh’s nomination. Kavanaugh’s nomination is to replace Justice Anthony Kennedy, who announced earlier this month he will retire effective July 31st. Justice Kennedy is often portrayed as the swing vote on the court, though it was Chief Justice John Roberts, not Kennedy, who twice provided the decisive swing vote on recent court decisions relating to the ACA. AHCA/NCAL Insurance Solutions is pleased to offer a new minimum essential coverage health plan to members. The new plan was developed by Compass Total Benefit Solutions and offers two new affordable options for providing many of the health insurance benefits that are important to long term care employees. The ability to offer a health insurance plan at little to no cost to employees allows AHCA/NCAL members to market their facilities as superior employers in comparison to competing employers. This plan is much less expensive to an employer compared to a traditional employee health benefit plan and costs far less than the expense of an employee who turns over. There are only a few more days to register for the AHCA/NCAL 69th Annual Convention & Expo at the early bird rate. All registrations made on or before Friday, July 20 are eligible for the lowest possible rate. After this date, advance registration rates apply. Time is running out, so don’t delay and register online today. Online registration is quick, easy and you can reserve your hotel at the same time. Attendees can choose from more than 70 sessions by attending education sessions from Sunday through Wednesday, attendees can earn up to 16 administrator CEs (separate ticketed sessions can increase CEs). Hear from top-notch speakers with advanced degrees, advanced experience, and a passion to further the profession. Our faculty is ready to share their considerable expertise with you. 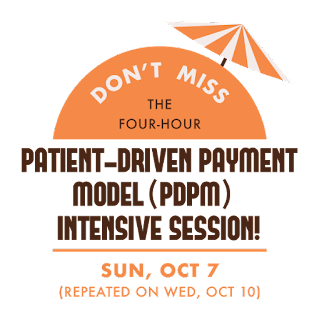 Escape to Sunny San Diego this October and join thousands of long term care and post-acute care professionals for this four-day premiere event of the year. Register Today! The agenda for the upcoming Skilled Nursing Facility (SNF) Quality Reporting Program (QRP) Provider Training in Baltimore, MD, on Tuesday, July 31, and Wednesday, August 1, is now available under the Downloads section of the SNF Quality Reporting Training webpage. The training will start at 8:30 a.m. EDT and end at 4:30 p.m. EDT on July 31, and start at 8:30 a.m. EDT and end at 3:00 p.m. EDT on August 1. The in person event is full with opportunity to register for a waiting list. There is also opportunity to register to attend remotely. Click here to register for this event. On July 16 at 2:00pm (eastern), AHCA staff experts will offer an overview of CMS’ proposed Patient-Driven Payment Model (PDPM) and highlight AHCA comment areas that are of most importance to members. AHCA also will provide an outlook for what may be contained in the final rule. The webinar will be recorded and archived and no CE credit is available. Speakers: Mike Cheek, Senior Vice President, Reimbursement and Dan Ciolek, Associate Vice President, Therapy Services, AHCA. 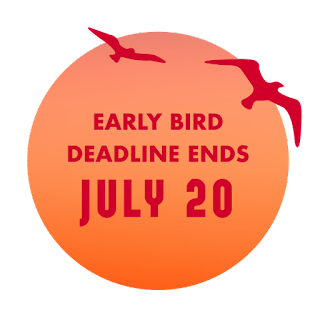 REGISTER TODAY AND YOU COULD SAVE UP TO $200! Providing quality care is the bedrock of what you do. Our Dementia Care, Post-Acute Care, and Quality Improvement tracks will put you on course to provide compassionate person-centered care, achieve your Quality Initiative goals, and operationalize quality improvement to help you achieve and maintain positive gains in all metrics. We can also help you maximize the use of your organization’s data to drive organizational improvement. Learn about the power of data, how best to use it, and what tools can help. Convention gives you four days of education, expert speakers, and unlimited opportunities to learn from each other. You are sure to take home immediately implementable strategies to solve even your toughest challenges and improve the quality of care you provide. So don’t miss out! Register today, and join us in San Diego in October. We look forward to hosting you. Provider magazine has won a bronze EXCEL Award from Association Media and Publishing for its comprehensive cover story on pressure ulcer care, “Building the Best Wound Programs.” This is one of just four awards in the Magazine categories for a feature article for 2017. The 2017 cover story showcased new therapies and developments in wound care and highlighted the critical aspect of caregivers in sync with residents. The EXCEL Awards recognize excellence and leadership in nonprofit association media, publishing, marketing, and communications. The competition is open to nonprofit organizations and for-profit industry service partners. Provider Magazine received the bronze award during the Annual EXCEL Awards Gala, held June 25 in Washington, D.C. The Centers of Medicare and Medicaid Services (CMS) announced in a MLN Matters article that they issued instructions to the Medicare Administrative Contractors (MACs) about updates to the Skilled Nursing Facility Prospective Payment System (SNF PPS) rates for Fiscal Year (FY) 2019. For FY 2019, the SNF payment increase factor is 2.4 percent. These rate changes (before any facility-level adjustments related to the SNF Value-Based Payment (VBP) and Quality Reporting Program (QRP)) will be effective October 1, 2018. Billing staff should be aware to look for further details from their MAC. Annual updates to the PPS rates are required by Section 1888(e) of the Social Security Act, as amended by the Medicare, Medicaid, and SCHIP Balanced Budget Refinement Act of 1999 (BBRA), the Medicare, Medicaid, and State Children’s Health Insurance Plan (SCHIP) Benefits Improvement and Protection Act of 2000 (BIPA), and the Medicare Prescription Drug, Improvement, and Modernization Act of 2003 (MMA), relating to Medicare payments and consolidated billing for SNFs. Each July, CMS publishes the SNF payment rates for the upcoming FY (that is, October 1, 2018, through September 30, 2019) in the Federal Register, available online. The update methodology typically includes a forecast error adjustment whenever the difference between the forecasted and actual change in the SNF market basket exceeds a 0.5-percentage point, and an update to the Federal rates using the latest SNF full market basket adjusted for productivity. However, for FY 2019, the SNF payment increase factor is 2.4 percent, as required by Section 53111 of the Bipartisan Budget Act of 2018. Much is being written these days about how businesses are successfully using training and education as an effective employee retention strategy in the competitive labor market. Long term care organizations can capitalize on this trend while building a core team of dementia specialists within their organizations at an affordable price. Each member of your team completing the C.D.S. will learn quality dementia care strategies based upon the Alzheimer’s Association’s new Dementia Care Practice Recommendations. Having caregivers who are credentialed dementia specialists translates to a far more efficient and effective dementia care team and reduces staff reliance on licensed nurses to solve the repetitious questions and issues that arise daily when providing care to residents with dementia. It also provides employees with a higher level of care knowledge and expertise that allows them to grow personally and professionally. AHCA/NCAL members are encouraged to give the CARES training program a try as part of their employee retention strategies and remember to use discount code AHCA10 when you check out.